The Global Volcanism Program has no activity reports for Makaturing. The Global Volcanism Program has no Weekly Reports available for Makaturing. The Global Volcanism Program has no Bulletin Reports available for Makaturing. Makaturing volcano rises above the shore of Illana Bay at the west end of a chain of volcanoes in central Mindanao. Eruptions at one time attributed to Makaturing were ascribed to neighboring Ragang volcano to the east by the Catalog of Active Volcanoes of the World (Neumann van Padang, 1953), but PHIVOLCS (2004) listed eruptions for Makaturing, several of which are in the same year as those from Ragang volcano. A dense cover of vegetation that blankets Makaturing suggests long quiescence, but solfataric activity continues. There is no Deformation History data available for Makaturing. There is no Emissions History data available for Makaturing. 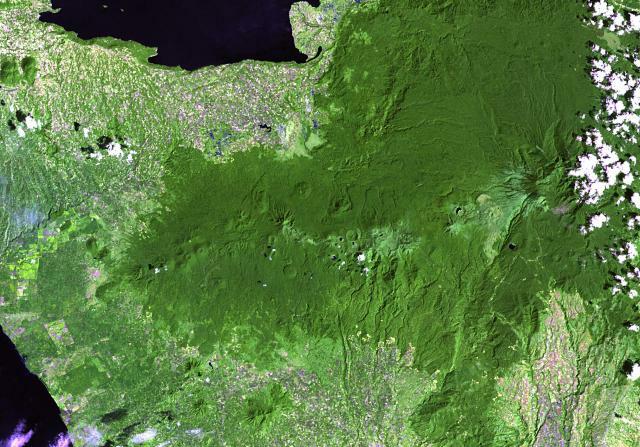 Makaturing volcano (left of center) rises NE of Illana Bay (lower left) and south of Lake Lanao (upper left) at the west end of a chain of volcanoes in central Mindanao. Several prominent pyroclastic cones are visible on its flanks. Eruptions from this volcanic chain (including Latukan volcano, right-center) have variously been attributed to Makaturing and the historically active Ragang volcano (far right-center). There are no samples for Makaturing in the Smithsonian's NMNH Department of Mineral Sciences Rock and Ore collection. Large Eruptions of Makaturing Information about large Quaternary eruptions (VEI >= 4) is cataloged in the Large Magnitude Explosive Volcanic Eruptions (LaMEVE) database of the Volcano Global Risk Identification and Analysis Project (VOGRIPA).